Outward opening manhole cover type HLSD-2 is used on top of pressurized tanks and containers where closeable means of access to the interior of the vessel is required. HLSD-2 is approved and can be used on pressure vessels according to PED 97/23/EC. The Alfa Laval oval manhole cover LKD 440 x 320 is especially used on tanks or containers in the wine and juice industry. The Alfa Laval oval manhole cover LKD 542 X 446 is used on tanks or containers where a closeable means of access to the interior of the vessel is required. The main features are angled shaped frame ensuring a shadowless installation optimal for CIP application. The circular LKDC stainless steel manhole cover is used on top of tanks or containers, especially in the dairy industry, where a hygienic closeable mean of access to the interior of the tank is required. The circular low pressure LKDC  LP stainless steel manhole cover is used on top of tanks or vessels. It is designed to withstand vacuum created during for example cleaning and for productions with low pressure conditions up to 1 bar. Suitable for wine, brewery, juice, milk, food, personal care and pharmaceutical applications. The circular LKDS stainless steel manhole cover is used on top of tanks or containers where a closeable mean of access to the interior of the tank is required, and is especially suitable for dairy balance tanks and CIP holding tanks. The Type C stainless steel manhole covers are used on tanks and containers used in a wide range of hygienic applications such as wine, beverages, dairy and foodstuffs. They are designed to fit where a closeable mean of access to the interior of the vessel, situated above or below the liquid level, is required. 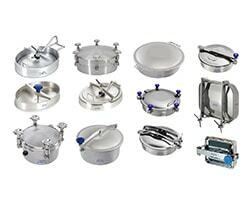 The Type O stainless steel manhole covers are used on tanks and containers used in a wide range of hygienic applications such as wine, beverages, dairy and foodstuffs. They are designed to fit where a closeable mean of access to the interior of the vessel, situated below the liquid level, is required. The Type R stainless steel manhole covers are used in bottling and washing machines and industries where removal of pulp from the bottom of a tank must be done occasionally, eg: wine and juice industry. They are designed to fit where a closeable mean of access to the interior of the vessel, situated above or below the liquid level, is required.